On a cold night in 1903, a dance was in progress at Schunk’s Hotel in Patchin when a fire broke out in the horse shed spread to the hotel. Over a hundred guests vacated the hall but some lost their overcoats and wraps, which caused considerable discomfort, as it was twenty degrees below zero. 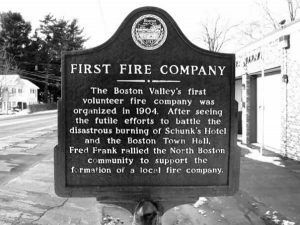 The hotel and the town hall across the road burned down, but this prompted Fred Frank to organize the first fire company, in North Boston. The Boston Fire Company was formed in the fall of 1908, and at a later date, a company was organized in Patchin. Beginning with old fashioned hand pumps these companies have repeatedly acquired improved equipment until today the town has three well equipped fire fighting organizations with a mutual aid arrangement. Through the years, there have been many fires in Boston, but most of them have been confined to one or two buildings. In 1893, several buildings burned in the village of Boston, but the worst fire took place there on August 20 th , 1920. Fire started shortly after midnight in the Boston Garage, where the village fire pumper was temporarily housed. Being unable to save the pumper left the fireman to form a hopeless bucket brigade. Calls went out to nearby places and their fireman responded. A call to Buffalo brought a fire engine from there. A flood had washed out two bridges in the valley, but in spite of that, the run from Buffalo was made in thirty-five minutes and the engine pumped from the creek onto the fire. However it was too late to save five buildings: Boston Garage, the house of Charles Hund, the two story Grange Hall, Schmitt’s hotel, and the hotel of Jacob Michardzinski. The loss was estimated at $30,000. In 1903, construction was started on a railroad through the Boston Valley. A steam shovel, donkey engines, and dump cars were brought in to make the cuts and fills to form a roadbed along the eastern hillside. Building a trestle across the gullies made most of the fills and dumping earth from them but at Landon Brook, south of Boston Village, the gully was so deep that cables were stretched across and tracks laid on them instead of building a trestle. In 1906, people were delighted when the Goodyear brothers of Buffalo began operating the railroad from Buffalo to Wellsville. This railroad formed a connection between railroads, saw mills, and coal mines owned by the Goodyears in Pennsylvania, and their docks and steamships on the lakes. It was advertised as the scenic route and was busy with both passenger and freight traffic, but it lasted only ten years as the whole Goodyear empire began to crumble. In 1916, the tracks and bridges were sold as junk, at wartime prices, and later most of it was shipped to France but, it is said, part of it was sunk in the Atlantic by Germans submarines. The loss of the railroad was a dire blow to the prosperity shipping facilities to take its place. When the railroad was being built in 1904, the contractor on this section wanted a telephone so that he would not have to drive to Hamburg each time he needed to contact his employer or order supplies. He interested Frank X. Weber, and together they visited the telephone companies in Hamburg and Buffalo but they were not willing to extend their lines as they did not think there would have enough subscribers to make a line pay. Frank X. Weber, Fred Frank and Jacob Broadbeck organized the Boston Valley Telephone Company and sold shares for $10, only one to a person. These men, with some help, set the poles and strung the wires. Mr. Corbit, the railroad contractor, was the first to have a telephone installed. It was planned to have one telephone each in North Boston, Patchin, and Boston, but by the time the line was finished, there were several subscribers. Eventually, there were seventeen lines extending as far as Colden, West Falls, New Oregon, and half way to Springville. In 1925, there were 342 telephones in operation, and 351 shares had been sold. This local company operated from 1905 to 1932 and paid an average dividend of more that 10%. On January 1 st , 1932 the Bell Telephone Company took over the lines after paying the stockholders $32,000. This local effort had paid off handsomely. When in 1908 the rural free delivery of mail was started in Boston, Howard Owen began delivering mail with a horse and buggy. He continued his daily rounds until 1957, but in the later years he used an automobile. During World War II, he published a monthly booklet, the Boston Valley News, which he mailed to everyone who was in service from here. These booklets were much appreciated by the service men. About 1909, the Boston Creamery Association opened a creamery, on the Boston Colden Road just off Route 219, to which many farmers brought their milk. This building has since been converted into a dwelling. In 1911, the Grange was organized with twenty-six members. After meeting in various places for four years, the Grange bought Hund’s Hall n Boston Village. This building was destroyed by fire in 1920. As the Grange grew in membership, it became increasingly difficult to secure satisfactory meeting places and in 1933, the present Grange building was started. Dedication took place October 14 th , 1935. In 1936, they celebrated their silver anniversary. The Rockwood and Trevett families furnished more members than any other families, and Mrs. Eliza Trevett who lived to the age of ninety-eight was an active. History repeats itself, and in 1944, murder again occurred in our town. In a summer cottage on the Back Creek Road between North Boston and Patchin, Walter Nowicki of Blasdell, shot and killed Jacob Schmidt and his son, Lawrence Schmidt. He also wounded Miss Edna Halliday. The victims were all from Kenmore. Nowicki then turned the gun on himself with fatal result. A love triangle seems to have been the cause of the tragedy. Each year the Boston fire companies have held a carnival to raise money to carry on their work. Beginning in 1949 and continuing until 1959, international bicycle races were held in connection with the carnival at Patchin. These were arranged by Ted Nowak and resulted in two Olympic trials and attracted considerable interest of sports fans. In 1920, the Boston Rod and Gun Club was organized, and in 1931, it became the Boston Valley Conservation Society. In 1949, a long club house was completed on Zimmerman Road. This building has served the community well, not the least among the activities centering there have been the many square dances. The town has been exceedingly fortunate in the doctors who have served the ill and the ailing. Dr. Blanchard lived in Patchin for a long time, and later Dr. Jennings came to Boston Village. He traveled over the hills for miles around for nearly fifty-seven years, answering all calls of sickness and distress at any time of day or night, in all kinds of weather. Dr. Jehle also served for many years in the same village. More recently Dr. Hans Krakauner carried on in the same fine tradition until his death in 1961. After the death of Dr. Jennings, a memorial library was started in the village of Boston in 1939, with Leland Dye as president. This library served for a time, but it was difficult to finance it adequately and its usefulness was limited. In 1947, a movement was started by George Stein, which resulted in the formation of the Boston Free Library Association. A library was opened in the old firehouse on the Boston Cross Road. In January 1949, this library became a part of the county system and since then has been operated under contract with the Buffalo and Erie County Public Library. In 1955, the library moved into the remodeled brick schoolhouse on the State Road. Later, the building was acquired by purchase from the school district. This library, with county assistance in financing, continues to grow and stimulate intellectual growth, especially among the children and younger residents. The economy of Boston has changed greatly over the years. After the difficult times of early settlement, it developed as a general farming area. Sheep, producing wool and mutton, were profitable for a time; but as the land was cleared and put under cultivation, it became evident that the hill farms were best adapted to milk production, potatoes and cabbage, while the richer land of the valley was suitable for more diverse crops. Fruit growing became popular and at one time there were extensive apple orchards in the valley. As the hill farms were cultivated, the topsoil washed away and they became unproductive. Polish emigrants, who by hard work and long hours have succeeded in making a living in spite of the poor soil, brought many of these farms on the west hill. Whereas in earlier times, life on the farm was hard and social contacts few, the introduction of electricity of lighting and power, (about 1922 in the valley and later on the hills), the telephone, radio and television have revolutionized country living. Improved farming and milking machines have lightened the labor and improved communications have opened new vistas socially. Mrs. May Pingrey is believed to be the oldest living resident of the town. She has seen many changes during her lifetime. Automobiles have brought the city nearer, and more and more of the residents of the town have found employment in the industries of the city to supplement or take the place of the farm. This has changed the character of Boston to a considerable degree. The beauty of our countryside has long been recognized and many city dwellers are moving into the town and building developments are wiping out the farm lands of the past. It now looks as if within a few years it will become a typical suburban community. The building of the modern elementary school in North Boston in 1959 marked a great advance in educational opportunity for the children.